Rangers have agreed a fee with the Welsh club but the centre-back has a number of options. 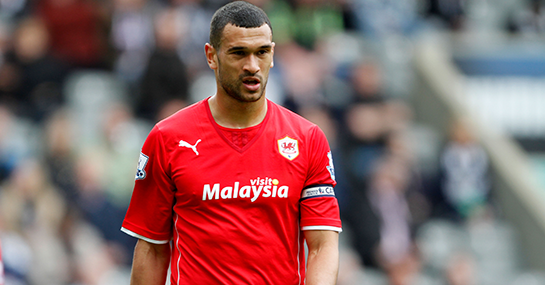 Steven Caulker looks set to spurn the advances of Harry Redknapp and turn down a move to Queens Park Rangers. The Loftus Road boss revealed earlier today that a fee between the west London club and Caulker’s owners Cardiff has been agreed, leaving the former Spurs player to discuss personal terms. Redknapp, who managed Caulker at White Hart Lane, believes the recent capture of Rio Ferdinand has put his side in pole position, with Caulker believing a stint alongside the former England captain will help him re-establish himself on the international scene. However, the Hoops are not the only club vying for the 22-year-old and the calibre of the sides interested mean Rangers could struggle to land their man. Southampton and Liverpool are credited with a strong interest in Caulker, while Arsenal are also rumoured to be keen on adding to their defensive ranks. All three represent a more attractive option than QPR at present, with Rangers winning promotion to the Premier League by the skin of their teeth last term. Redknapp was expected to guide his side to the Championship title with relative ease after retaining much of the squad that competed in the top flight the year before. However, a series of poor results left the club fighting it out in the play-offs where only a last gasp winner from Bobby Zamora saw them bounce immediately back. Arsenal and Liverpool are obviously the high-profile options at 13/2 and 9/1 to win the Premier League respectively but with Caulker looking for first team action Southampton looks his best bet. The south-coast club were flying under Mauricio Pochettino last term and despite losing key players are expected to go well again under new boss Ronald Koeman. And if it’s an England call up Caulker’s after Adam Lallana, Luke Shaw, Rickie Lambert and Jay Rodriguez can attest that St Mary’s is not a bad place to be. Saints may be priced at 16/1 for a top six finish in the league but with QPR’s odds standing at 100/1 they look set to have a much better season than their rivals.